Could Line Queues at Disney Theme Parks Be a Thing of the Past? What is one of the worst things about visiting any amusement or theme park? Line queues – waiting and waiting and waiting for an attraction that lasts only minutes or in some cases, 17 seconds (Top Thrill Dragster – Cedar Point). To Disney’s credit, they have done the best job out of all amusement/theme parks in creating queues that ease the frustration and in many cases, help tell the story of the attraction itself. What if line queues were to go away? Is it possible? John Frost at The Disney Blog wrote an interesting post on this very subject. In the post he makes reference to a new concept Disney is experimenting with – queue-less waiting zones. Apparently this concept was recently tested at Disney’s Hollywood Studios Rock-n-Roller Coaster. Rather than feed guests into either a fastpass or standby queue, they hand the standby guests a boarding pass with a number on it. Fastpass guests proceed as normal and standby guests are herded into a holding area. The guest can’t leave the holding area during the wait, but there are games to play or other forms of entertainment to make the time fly by. Then when the time to board comes near their boarding pass number is flashed on a board and the guest has five minutes to report for their loading opportunity. This system doesn’t reduce waiting time for standby guests, but it does give Disney another opportunity to provide total guest satisfaction instead of a stressful wait. This “queue-less waiting zone” idea was announced for the upgraded Dumbo attraction that will be part of the Magic Kingdom Fantasyland attraction. Could this be a new trend for all future attractions? 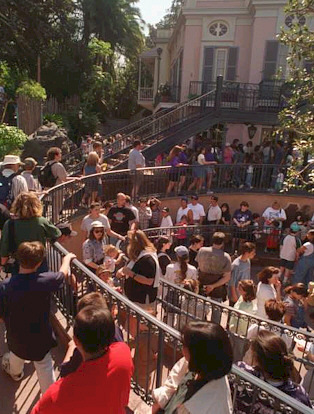 Or may we even see the queue areas of old attractions re-engineered? I can think of a few that certainly would benefit from this: The Submarines, Matterhorn, and Toy Story Midway Mania to name a few. Then there are those attractions where the queues are almost as awesome as the rides themselves. How about the tunnel system at Indiana Jones at Disneyland? Roger Rabbit’s Cartoon Spin? The Tower of Terror? While some attractions could certainly benefit from a “queue-less waiting zone,” I have to say that Disney does a better job with line queues than any other park in the world. If they are not setting the stage for the story that is about to be told, they are at least making the wait as comfortable as possible. You’ll rarely find this at Six Flags parks. So, with this new concept in mind, what attractions do you the reader think would most benefit with a queue upgrade? What attractions would you never want to see Disney Imagineers change? Let your thoughts be known in the Comments section of this post. I’m really excited about the queue-less queues idea. If they get it right, they could bring the same level of theming and detail to these “zones” that they do on attractions like Indy. I think it would obviously start with attractions that have the space for it now, like, for example, Rock ‘n’ Roller Coaster in DHS–where they’ve been doing a bunch of tests for the system already. I think any attraction that doesn’t have a strong storyline in it’s queue would benefit from this. My only fear is that somewhere down the line Disney will look more at attraction efficiency and less at attraction show and start omitting queues in the design stages of new attractions. Doesn’t sound like a good idea to me. Holding up the departure of a ride vehicle for as much as five minutes until the person shows up from the holding zone? I actually like waiting in line. There’s stuff to do if the queue helps tell the story, and if not, I enjoy chatting with the other visitors around me. It’s a great way to kill time, actually interacting and meeting people from all over the country (and the world, in some cases).